What makes us happy everyday? It’s in knowing that a lot of people love us no matter who we are and what our status in life is. It’s in knowing that somewhere and somehow people are thinking of us in a sweet and thoughtful ways. That’s why communication is very important in our lives. I remember when I was in high school that letters in our mailboxes makes me happy because I’ve got mails from my distant friends and relatives living in the province. It’s what you call the power of communication, you know a single letter can make a sick man get well, an angry fellow to relax, a lonely man happy and sometimes a war to freeze. Mailboxes are very important to me and I searched for stylish residential mailboxes that would look good in our house. I’ve found Mailbox and Beyond, a site which offers mailboxes, address plaques and signs, garden hose holders, personalized doormats, doorbells and a lot more. 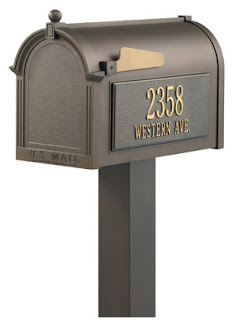 I’m particularly eyeing some whitehall products for our house because they are 20% larger than other mailboxes and made from die cast rust free aluminum.